Alanda December 17, 2014 2 Comments This post may contain affiliate links. Our stash of alphabet stencils was limited so we decided to make our own using the Brother Scan n Cut. Now we have alphabet stencils for just about every occasion using this quick and easy method. 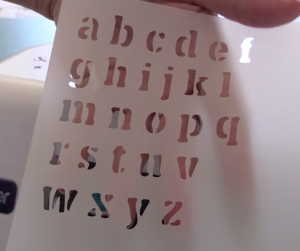 Check out the video to see how easy it is for you to make your own alphabet stencils. Font.com shows nothing but a white page. Here is a link to their page https://www.fonts.com . Its fonts.com.